You work so hard to make the landscaping around your home beautiful. However, the foundation walls around your home can be an eyesore creating an ugly sight. There’s no way to avoid ugly foundation walls which are so vital to anchor your home to the ground. However, there are ways to hide and beautify those areas. You can plant small trees, plants, bushes or ground cover around the foundation to help hide and make these areas look attractive. It is very important to ensure that your favorite plantings are placed where they will receive an adequate amount of water and sun/shade in order for them to flourish. Below are photos from a job Monsma Landscape and Maintenance recently completed. 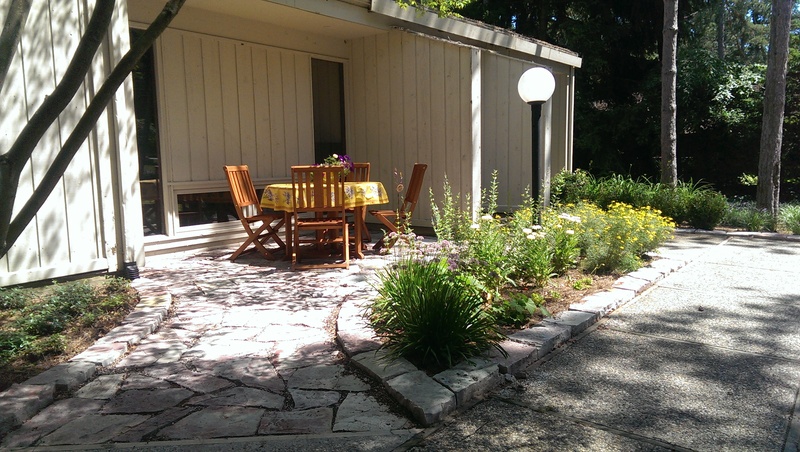 Monsma Landscape and Maintenance can create a relaxing and welcoming environment in your back yard. Our job is to let you Live Better Outdoors and we can design your back yard or patio space to fit your life style. It is important to make sure that plantings are correctly placed based on light, environment and soil. No matter how large or small your landscape project, we have the heavy equipment to perform your landscaping project efficiently and safely with the best possible results. We are committed to using the proper fertilizers and herbicides for the health and vigor of your plants, flowers, shrubs and trees. MLM applicators are certified and licensed by the State of Michigan; keeping your health and safety top priority. As your landscape and lawn care professionals, we care about our work and treat your property with the utmost care and respect. We offer weeding and yard maintenance services in the Grand Rapids area to keep your new landscaping looking as beautiful as it did on the day of installation. Monsma Landscape & Maintenance is properly insured for the safety and protection of you and your property. As everyone leads very busy lives these days and we are finding that customers are looking for ways to save time and or money on their landscaping. Low maintenance landscaping is a great way to go. This involves making sure you are using the correct, plantings as well as material to help prevent weed growth. We recently worked redid the landscaping around the sign of the Huntington Bank branch Portland, MI. This landscaping job involved us removing overgrown plants. We also installed some low maintenance plants and stone. Now they don’t need bark mulch by the sign every year! Monsma Landscape and Maintenance is proud to have been a part of Arbor Day in Grand Rapids MI and the planting we did at Martin Luther King Park in GR on Friday April 25, 2014. Here is an interesting article about Arbor Day provided by Friends of Grand Rapids Parks, April 2014. “Arbor Day is a wonderful opportunity to reflect on all the great things that trees do for us. From clean air and stormwater interception, to beauty and shade, trees provide a myriad of benefits to our City. Today, April 25th is Arbor Day. As we celebrate this day of trees, it’s important we keep in mind how critical trees are to making our City vibrant, livable, and enjoyable. 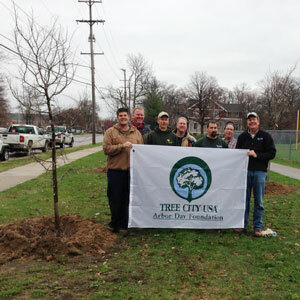 Arbor Day is an opportunity that we can all take to reflect on the goals that we have for our City’s Urban Forest. In 2011, our City officially adopted a 40% tree canopy goal. Since then, both the Friends of Grand Rapids Parks and the City of Grand Rapids have significantly increased their planting efforts. Last year alone, FGRP planted 479 trees; the most for us in one year. But expanding tree canopy is more than planting; it is also preserving and enhancing. Our large, mature trees contribute far more to our tree canopy than small, new trees will for several decades. As you think about the character of trees throughout our community, consider what you can do to help care for, tend to, or otherwise promote the health of one of our aging trees. …that trees are natural air filters? Just one tree removes 26 pounds of carbon dioxide from the air each year and can produce enough oxygen for a family of four? …that proper placement and selection of trees, shrubs, and perennials can lower heating and cooling costs by 20% and reduce noise pollution by 50% ? …that your healthy lawn is not only your family’s playground, but it also provides for air, water, and soil conservation? Recent sunny days and singing birds all help to get us in a better mood. All of us are hoping that winter will release its icy grip on us soon. 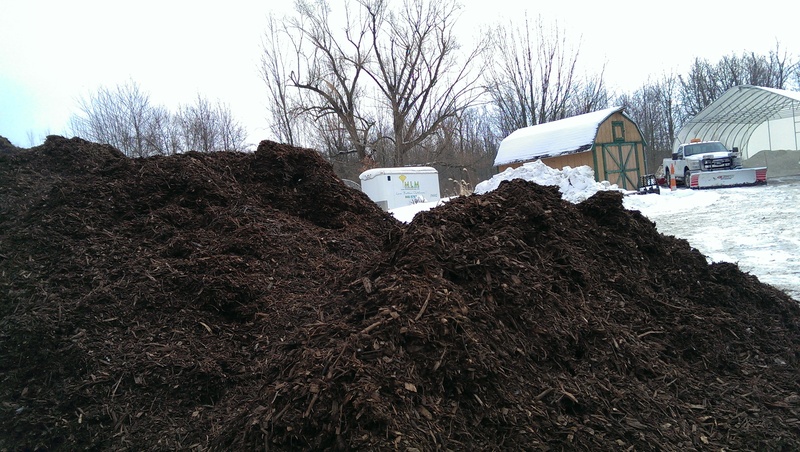 If you’re a Landscaper, nothing says Spring like a fresh pile of steaming bark mulch! 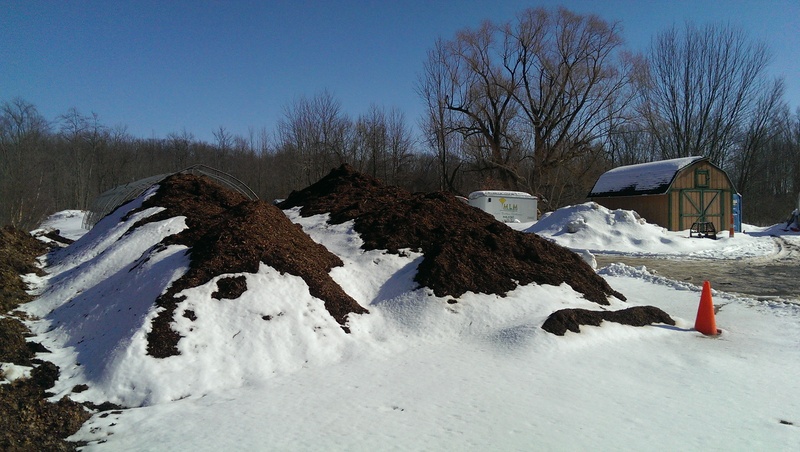 The aroma of that load coming off the truck tells us that it won’t be long before we can get outdoors and start getting your landscape in shape. Sadly, there is still more snow that will fall as well as plenty of snow to melt before we can start your Spring cleanup. Working on the Main Garden at the Home and Garden Show at Grand Rapids Devos Place this past week really got me excited for a change in the weather. At MLM, we are especially eager to hear from you so that we can help you Live Better Outdoors! We offer Spring clean-up services and bark mulching in the Grand Rapids area. Call Monsma Landscape TODAY (616) 868-5767 (616) 868-5767. THOSE SNOWFLAKES ARE SO PRETTY… until they all gang up on us!! This winter has been a challenge for everyone, with snow to plow at least once a week since early December, sometimes four times a week. And we have at least one more month of winter to go! 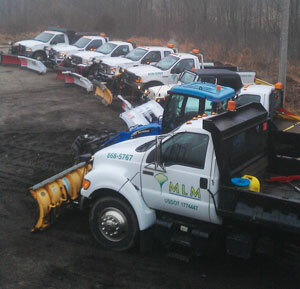 So how has your snowplow service been treating you? Do they clear the end of your driveway after the city plows it full of snow? Do they clear the snow away from your mailbox on the street if you ask? Are they answering their phone and returning your calls? Is your driveway or parking lot still getting plowed? If the answer to any of these questions is no, you will probably want to think twice before hiring them next year. Trees / Shrubs – Late fall feeding for trees and shrubs is recommended where a visible deficiency or stunting has occurred. Trees severely defoliated by Gypsy Moth may also benefit from feeding at this time. Lawn – The November lawn feeding has been touted as the single most important time to fertilize. Roots of turf are still active and will utilize nutrients to rebuild themselves for the coming season. A fall application of fertilizer will also give a quick green up in Spring. Pruning – Head back herbaceous perennial stems after the tops die. Watering – Irrigate newly planted ornamentals any time there is less than 1 inch of weekly rainfall and plants are actively growing. Apply water at the rate of 1 quart per square foot of planting area on poorly drained soils. On well-drained soils, use a half-gallon of water per square foot. Be sure to maintain adequate soil moisture this month to aid good root growth prior to winter dormancy. Plant Protection – For newly planted ornamentals, spread a 2- to 3- inch layer of mulch over the soil in the bed or around trees. Rodent tree trunk guards, mulch, rose cones and fabric wind screens around evergreens should be put in place before average temperatures are below freeezing. 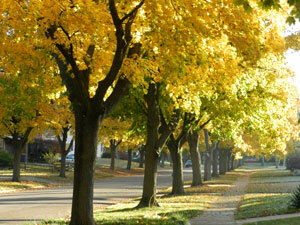 We offer a leaf removal service in the Grand Rapids, Ada and Cascade area. Rake your leaves to the curb side and we’ll take them away. We use a high sided truck to vacuum the leaves from the curb side of your property and leaf pile will be gone in minutes. Call TODAY (616) 868-5767 to take advantage of this service! A Fall Fertilizer application will send the nutrients to the roots and remember turf healthy roots that can out compete weeds produce the best lawns. West Michigan has cold and harsh winters and takes its toll on your lawn. Feeding the roots now helps the turf during winter and gives your lawn a great head start for spring. Fall Weed Control is important too! NOW IS THE BEST TIME of the year to kill weeds that are getting ready to go dormant. Spraying herbicide on weeds now, while they are storing nutrients for the winter is a great plan. We provide lawn fertilization service in the following areas – Ada, Cascade,East Grand Rapids, Forest Hills,Grand Rapids,Rockford, Lowell and Grandville. Call Monsma Landscape TODAY (616) 868-5767 to schedule a a fall weed and feed application!